Ray Roofing installs custom gutters and downspouts for industrial businesses throughout the state of Ohio. Regardless of the industry you’re in, we can customize the perfect gutters and downspouts for your business. There are several signs that could suggest your building is in need of new gutters or at least gutter repairs. For example, if you have loose or hanging gutters, frequent clogs in your gutters, or leaking and flooding within your structure, then new gutters may be your best and only option. Pooled water near your downspout, rusted gutters, and sagging gutters are all common indicators. 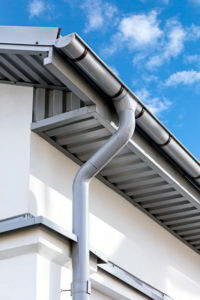 With custom gutters and downspouts, your building will have a system tailored to its unique specifications. That means you’ll have the gutter material that best suits your business and the size and color that best suits your building. For more information on roof maintenance, check out our blog! Protect your workplace’s roof with a metal coping roof cap. There are many advantages to installing a metal coping cap, including the fact it is easy to maintain, helps protect against cracks that could lead to water infiltration and it is available in different colors, ensuring you can distinctly complement the overall look of your building. In addition, metal coping systems protect your roof and building against damage that could be caused by strong Ohio winds. Custom gutters and downspouts are the perfect blends of quality and affordability. If you would like to learn more about them, the benefits of a coping metal cap, or to schedule a FREE consultation with one of our expert roofers, please contact us today.